A vintage-correct, true single-coil, 7-string pickup for producing the warm guitar tones of genres like surf, rockabilly, blues, and ska. The Seymour Duncan Vintage Staggered SSL-1 Electric Guitar Pickup is a vintage-correct, true single-coil pickup for warm 7-string guitars. The Vintage Staggered SSL-1 pickup delivers a deep, punchy tone with bright sparkle for single-coil Strats. 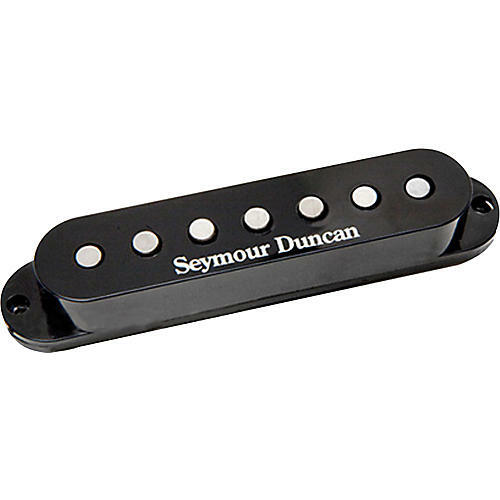 Seymour Duncan recommends the Vintage Staggered pickup for country, pop, surf, rockabilly, blues, ska, and classic rock. The Vintage Staggered SSL-1 7-string pickup is Seymour Duncan's most popular single-coil pickup for Strats. The hand-ground, Alnico V magnets and moderate windings with heavy, Formvar wire, yield a bright and punchy tone with vintage output. The Vintage Staggered SSL-1 pickup is perfect for guitarists who need accurate, traditional single-coil tone, especially with clean and mildly distorted amp settings. Compared to Seymour Duncan's APS-1, the SSL-1 has a more focused "bell" tone with a light bass response. Comes with waxed, cloth hookup cable and a vintage-style, "keyed" bottom plate. Recommended for any guitarist who wants to marry a vintage sound with the new era of 7-stringed guitars. Complete with hand-ground, Alnico V magnets, the Vintage Staggered SSL-1 complements a humbucker like Seymour Duncan's SH-4 JB 7-string (sold separately) in the bridge position, along with a neck pickup like Seymour Duncan's SH-1n '59 7-string (sold separately). Add an all-tube overdrive like the Seymour Duncan SFX-11 Twin Tube Blue for the ultimate in tone. For warmer toned ash, alder, or basswood-body instruments. Works especially well with rosewood fingerboards. Chris Hicks, Kent Wells & Land Scott / Reba McEntire, Dan Schafer / Shania Twain, David Levitt / Alanis Morissette, Doug Pettibone / Lucinda Williams, Scott Henderson / Tribal Tech & Scott Henderson Trio, Jimmy Crespo. Built at Seymour Duncan's Santa Barbara, California workshop. Wish they all could be California pickups? They can when you order these Santa Barbara-made pickups meant for producing warm tones like those heard in surf music.